The sun is out and the temperatures are rising: It’s summer time! And although the summer brings BBQs, pool parties and “summer Fridays” in the office, there’s one area, although often overlooked, that is also associated with this season—networking. When the weather is nice, the majority of us want to be outdoors, right? The folks at businesses and organizations are no different. And that’s why during the summer season you’ll discover many networking opportunities, from waterfront college alumni association meetups to rooftop professional mixers. But during this time of year, it’s important not to miss out on networking opportunities because they don’t look like networking opportunities. Remember the BBQs and pool parties mentioned earlier? These summertime events are opportunities to network as well. Sure, the pool and a nice grilled burger don’t set the typical scene to hand out business cards, but you never know who you may meet while you’re out and about, especially if the summer outing is business related. So, to help you understand how to effectively network this summer, Recuiter.com received help from Jason Hanold, CEO and managing partner of Hanold Associates, HR Executive Search. Effective networking at summer events is best saved for those who are adept at reading a room and nuanced in relationship-building, otherwise it may prove counter-productive. 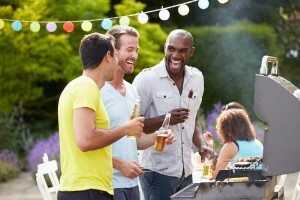 Understanding that people are gathering together during the summer to celebrate, socialize, and enjoy the outdoors and special occasions, they often leave their “professional psyche” behind. Few are attending to discuss business, in fact, that is the last thing they want to think about, especially those whom are in demanding, high-stress roles. Therefore, one doesn’t want them to feel as though they need human repellent to keep the overt networker away. View this first as relationship-building. That said, it is always best to be prepared and know how to describe the best of you or the best of what you do quickly, and then move on. If there is an interest, others will ask for more. Be overt in your networking attempts, or in their face. People are there to have fun, and often to forget about work. Push your agenda to a disinterested crowd, you will become known for all of the wrong reasons. Attend an event with the primary mission and goal of networking, enjoy the moments and celebrations in life, and view a new relationship or contact as a beneficial by-product outcome from such an event. Forget that this is all about relationship-building. Your goals for networking will come after this is done well. Ask questions about others. People love to talk about themselves. The best way to get people to feel as though they trust and know you is actually when you know them. Read the room, make wise decisions about whether talking business or about your job interests is really appropriate in the setting. Networking is most effective when nuanced. Practice describing what you do or aspire to do in a sound-bite. If you have a chance to drop it in conversation, great! Then allow others to ask more questions and move on.